This project is one that I'd wanted to start for awhile, but it was only when Roy Hay gave me a stack of 30 odd match programs that he had salvaged from FFV's archives that I finally found a reason to do it. Thanks to everyone who has made these available, either on their own websites or by allowing me to scan them - including the aforementioned Roy Hay, Damian Smith, Chris Egan, The Agitator and The Man In The Stands, Ian Syson, Luke Patitsas, and Todd Giles (Newcastle programs). Huge thanks in particular to The Agitator, the source of most of these match programs, who also scanned and collated many of them, so most of what I had to do was just upload them. Anyone who wants to help add to the collection, please get in contact with me. If you are looking to send me match programs already in a pdf format, I would prefer you to send files where the images are the right way up (ie, not needing to be rotated). I am also happy to accept scanned images of match programs which have not been collated, as I am easily able to collate them into a pdf on my own computer. Feel free to download and share these as widely as possible, as it's one of the main reasons I have uploaded them - to preserve and spread a part of our history. Any document you download from this blog that has '(OCR)' at the end of its file name should work (to varying degrees) should you wish to search for keywords within the text. The technology isn't perfect however, and on some documents some words or parts of words may not come up in a document search - therefore you may need to be a little creative. Hopefully converting these files to an OCR format means that they will also be indexed by search engines. Round 12, Sydney City (away) - while not part of a double header, this program also doubles as a program for Marconi vs APIA. Round 7, Parramatta Eagles (away) - my source for the 1992/93 match programs does not have this one. Anyone who can help fill in this gap, please email me. Round 17, Preston (away) - there may not have been a match program for this fixture. If you do have a copy, please get in contact with us. Round 8, Parramatta Melita (away) - my source for the 1994/95 match programs does not have this one. Anyone who can help fill in this gap, please email me. Round 13, Melbourne Knights (away) - played a month earlier due to national team commitments. Round 25, Adelaide City (away) - includes editorial markings for next home match program. Round 30, Marconi Fairfield (away) - incorrect round and date printed on the cover. Round 32, Brisbane Strikers (away) - my source for the 1995/96 match programs does not have this one. Anyone who can help fill in this gap, please email me. Round 13, Collingwood Warriors (home) - this programme's cover incorrectly has 'round 11' instead of 'round 13'. Round 22, Marconi Fairfield (home) - includes rounds 24 and 26 vs West Adelaide and Canberra Cosmos. Round 24, West Adelaide (home) - includes rounds 22 and 26 vs Marconi Fairfield and Canberra Cosmos. Round 26, Canberra Cosmos - includes rounds 22 and 24 vs Marconi Fairfield and West Adelaide. Round 19, Marconi Fairfield (home) - includes rounds 23, 24, and 26 vs Gippsland Falcons, Perth Glory, and Carlton. Round 23, Gippsland Falcons (home) - includes rounds 18, 24, and 26 vs Marconi Fairfield, Perth Glory, and Carlton. Round 24, Perth Glory (home) - includes rounds 19, 23, and 26 vs Marconi Fairfield, Gippsland Falcons, and Carlton. Round 25, Sydney United (away) - my source for the 1997/98 match programmes does not have this one. Anyone who can help fill in this gap, please email me. Round 7, Carlton (home) - Paul Trimboli's 300th league game for South. 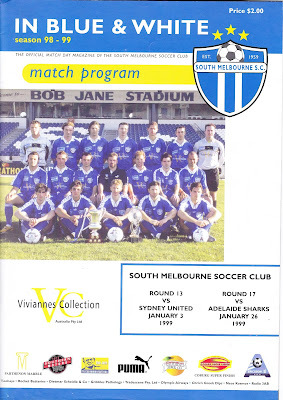 During this season and the following one, South Melbourne's match program was released on a monthly basis, hence the reason for so many games being bundled up together. In addition, due to South's participation in the World Club Championships in 2000, several home matches during this season were deferred. Round 18, Carlton (home) - as Carlton had become defunct in the early part of the season, I assume no match programme was prepared for this fixture. Round 28, Eastern Pride (home) - as Pride had become defunct, I assume no match program was prepared for this fixture. Minor semi-final, Adelaide United (away) - South's final game in the National Soccer League. A couple of notes on the Victorian Premier League and National Premier Leagues era - few clubs, including South Melbourne, bothered to create match programs, hence the paucity of materials for the following section. In some years South created generic/all purpose match programs which were meant to cover all home games, with no match specific efforts produced. Round 6, Melbourne Knights (home) - game never played, forfeit to Knights. Grand Final, Heidelberg United - included mostly as a subset to the Melbourne Victory vs Adelaide United W-League match held as a curtain raiser. The only game I remember going to in the post 1976 era (my father was not interested, and my uncle would occasionally take me until he returned to Greece in 1976), pre 1983 era (I was old enough to travel on my own) was the 1979 game against 'Macaroni' with my friends father. We got hammered 4 Nil and Ollerton missed a penalty. Just to clarify my 'Macaroni' remark. It was what us young teens referred to Marconi (obviously). We didn't know what a 'Marconi' was, so we ridiculed it. Similar to what a 'New Dawner' would do now? Oh! So you found the Match Day Programme! A woman's team? Any Greek women? Three Athanasiadis sisters. One of them got in contact with the club last year (I think she maybe lives in the States these days), so hopefully she remembers to bring her collection of photos to the club when she's in Australia in February. 3 Greek sisters involved in a, then, uncustomary field. Check 1979 vs Marconi programme (page 8) for a short article on the South women's team. The 1997/1998 season was when I had my letter printed. It was also where Postecoglou wrote an article stating that the Ethnic Clubs will endure over the 'new fads'. So, hopefully you have them? Unfortunately the batch that I'm scanning and uploading at the moment does not include any material from the 1996/97 and 1997/98 seasons. Here's hoping one of our readers comes through with something, otherwise I may have to get access to the club's archives. Thank you so much to The Agitator for sending through some stuff from his collection, with more yet to come. Phenomenal effort from The Agitator, every home and away programme from 1992/1993 bar Melita away and Preston away (the latter of which may not exist). Looking forward to more material, and glad to see others getting in contact with me about sharing match programmes and other historic Australian soccer materials. 1994/1995 home and away season complete barring Parramatta away. Added 1975 Ringwood City Wilhelmina away (league) and 1980 Victorian women's cup final (Greensborough vs South Melbourne). These had been made available as uncollated images by The Man In The Stands - I've collated them into pdfs for the purposes of this project. Unbelievable additions today thanks to The Agitator. Heaps of additions to the 1980s, some 1990s and 2000s, and smattering of VPL era stuff. I lost count of how many match programmes we uploaded yesterday. Re: my letter 1993/1994 round 25. Titans v Lakers v Blues? Are we the only club without an actual nickname? Or can other migrant based clubs also claim not to really have a nickname? Why have nicknames? Nicknames in this case are meant to disassociate the clubs from their ethnic identities. In soccer at least, the idea has usually seemed to me to let the nicknames derive organically, but in Australian sport more generally (and especially from the 1970s onward) there has been a tendency to try and come up with nicknames/gimmicks for marketing purposes. For South, Hellas of course is both official (historically, in its founding and as the current name of the controlling company), unofficial (in that the name is almost never used for football matters, but still used by both our fans and our opponents), but you also have 'blues' (generic, but never caught on as much as it perhaps could have), but also the shorthand of 'South' has always been an easy linguistic substitute - someone in Melbourne soccer circles mentions 'South', most people will know which team they're talking about. You may recall also that during the mid 1990s in Victoria, the Premier League clubs all adopted the same branding/logo style, adopting (usually) an animal nickname. Some of these were obvious (Preston, Bulleen) some less so. Port Melbourne still maintains both the logo and nickname, though most of the relevant clubs have moved on from either the logos, names or both. Having said all of that, even the 'Greek' nicknames applied to lower level state league clubs weren't always there from the beginning, and only applied later on. For example Altona East started off in green and gold, because they figured they were in Australia, they may as well adopt Aussie colours! Ange Postecoglou's letter about the Old and the New guard in Australian Soccer in 1998 has not been uploaded yet, but he appears to be 'worried' about the changing nature of the game, as he has another letter in the Home Match against Olympic about how old clubs are dying. Added a whole stack of stuff from 1996/97 onwards, thanks again to The Agitator. That programme from '78 is fantastic. F.U. Alexander. Would love to see that as a banner.